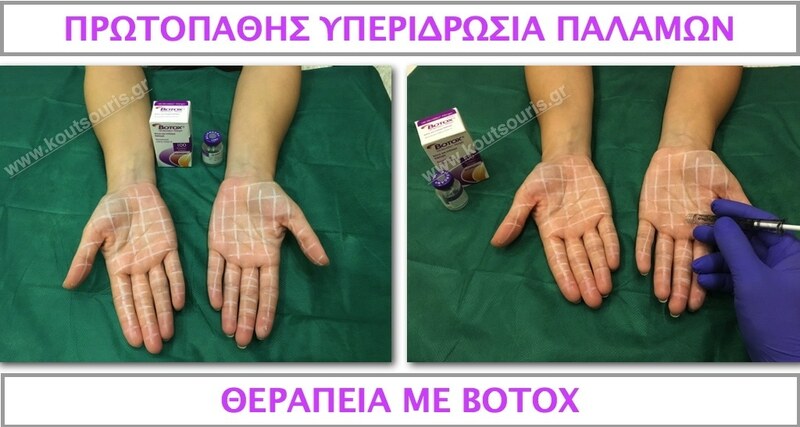 The most common hyperidrosis type is the axillary hyperhidrosis, while the most tortuous is the palmar because makes difficult the manual activities and limits social contact. In many cases all of the above three hyperhidrosis types coexist. How frequent is the hyperhidrosis phenomenon? Hyperhidrosis is a frequent pathological phenomenon concerning 1 – 3% of population and equally occurs to both sexes. It frequently appears on individuals of the same family (i.e. there is a hereditary tendency without knowing the way of transmission of the gene). In rarer cases, it may appear as a sporadic phenomenon. Hyperhidrosis is in most cases subclinical for the first years and is fully shown after the second or third life decade. How many hyperhidrosis types exist? There are two hyperhidrosis types: primary and secondary hyperhidrosis. a. The primary hyperhidrosis is a spotted illness due to the excessive activity of the sympathetic nervous plexus of the organism. It mainly concerns the sweat glands in the armpits, feet and palms and is characterized by a particularly annoying and excessive sweat production. The cause of the sweat glands overacting at the primary hyperhidrosis is unknown, but it has been believed that there is a hereditary tendency. In such cases, hyperhidrosis begins in the early adolescence and there is almost always a positive family history. Also, the primary hyperhidrosis may appear after stressful situations or in combination with a syndrome. b. The secondary hyperhidrosis is always a result of an underlying pathological condition. Metabolic diseases or endocrine disorders may usually cause excessive body sweating. Such diseases are infections, cardiovascular damages, hypoglycemia conditions, thyroid diseases, intake of antidepressants, diabetes, menopause, etc. Are there any criteria to check the hyperhidrosis type? There is at least one hyperhidrosis incident per week. Usually there is no focal attack but generalized hyperhidrosis. Hyperhidrosis can be diagnosed two ways: qualitative or quantitative approach. During the qualitative approach, starch powder is applied in the area under examination and it is rubbed with 5% iodine tincture, which remains for five minutes. If there is hyperhidrosis then the area is stained intensely with a violet or deep black color. This test is called as starch – iodine test (Minor test). During the quantitative approach, an absorbent paper is applied for 5 minutes per area, which is then weighted using a precision scale. The test of axillary hyperhidrosis is positive if more than 50 mgr. of sweat are produced per armpit within 5 minutes. Is there any contemporary treatment for the primary hyperhidrosis? Botulinum toxin is the medicine for the hyperhidrosis treatment. It is an FDA approved treatment, the correspondent European Commission and of course the EMA for the long-term reduction of undesirable excessive sweating of armpits, palms and feet. Can Botulinum toxin help me if I suffer from excessive sweating in armpits, palms and feet? Yes, it has been proven it can. The application of Botulinum toxin in such areas can totally eliminate the excessive sweat production for about 6 – 9 months for the axillary hyperhidrosis and 5 – 7 months for the primary feet hyperhidrosis. The required Botulinum toxin dosis is 50 u per armpit and 100 u per palm or foot. It is a simple, effective and easy treatment and above all safe treatment offering a remarkable improvement of the life quality of patients, suspending any psychological, social or professional effects, caused by this disease. How is the ƁOƬOX treatment for the primary hyperhidrosis of armpits-palms and feet performed? It is already known that ƁOƬOX is an injectable medicine. In the case of primary hyperhidrosis, we use a very fine special needle for this treatment performing small pinches in 0,5 cm distance from one area to another. This way, we create an active complex of the medicine deactivating the majority of sweat glands in the treated area. No. It is a completely painless procedure since we use an anesthetic cream, which penetrates and anesthetizes the application areas and the needle for the medicine injection is very fine, so analgesia is a matter of science. The pinch of the special needle does not hurt and the only thing that we feel is a slight annoyance due to the medicine. How fast does the Botulinum toxin acts when treating of primary hyperhidrosis? It is important to know that the result of Botulinum toxin action does not appear immediately after the application. The medicine effect starts to be noticeable 2 – 4 days after the application and the result of ƁOƬOX action is maximized after 10 to 14 days, so the excessive sweating production stops. Could Botulinum toxin cause any side effects when it comes to armpits, palms and feet primary hyperhidrosis treatment? Given that the medicine effect is fully reversible and exclusively local (it is spread in at least 1 cm distance from the injection point), NO SIDE EFFECT appears. Some mild side effects might be redness, a slight swelling or bruising. Is there something that I should avoid after ƁOƬOX during the primary hyperhidrosis treatment? We should bear in mind that the Botulin Toxin contained in ƁOƬOX is a very sensitive protein. Namely, since they are very sensitive in high temperatures we should avoid hot water shower, hot air exposure for the next 3 – 4 hours. It would also be nice to avoid aspirin or alcohol consumption until the next day. Is it safe to undergo ƁOƬOX for the treatment of primary hyperhidrosis when it comes to armpits, palms and feet? We should definitely mention the safety of the medicine when it comes to armipits, palms and feet of primary hyperhidrosis treatment. Scientifically based studies have proved that the Botulin toxin injections are the safest methods for the hyperhidrosis treatment. The same protein is used for many years in ophthalmology, neurology and other medical specialties for the treatment of many diseases and malfunctions with impressive results.